You can imagine our surprise and delight when we had our daughter and she is an "angel" compared to our son! We are still holding our breath and waiting for the endless crying and fussing to start. However, it HASN'T! She is now 6 1/2 weeks old and is a very happy, content baby! She loves to nurse and cuddle, but she is also content playing on her play mat, sitting in her bouncer, and swinging in her Cozy Coo Sway Seat! She even sleeps in her crib for a morning nap and sometimes I think she would sleep all day if I didn't wake her to feed! She is practically sleeping through the night too! Sometimes, it feels too good to be true! :) But we are enjoying every moment and she is getting so big already! If I had to pick her favorite place to relax, it would have to be her Cozy Coo Sway Seat. One of the reasons, I think, is because of the gentle side-to-side motion that is so soothing to her. Plus, the seat is extremely plush and comfy! There are so many comfortable cushions for not only comfort, but it keeps her tiny body in position! She is also starting to stare at and watch the fun built-in mobile that has some cute little bug plush toys! I love to mix up putting on one of the eight calming melodies or nature sounds but she seems to like the music the best! It was really easy to put together (even with a 2-year old's help!) and was together in about 10 minutes! My favorite feature has to be the option to have it either plug-in or battery operate — I have never had that with swings we have had in the past and it is so refreshing not to have to change expensive batteries every week! When this swing is running, I never even hear it (unless the music or sounds are on). That is how quiet it is! Plus, I LOVE the colors. They are so rich and warm and I just love the blue and brown color combination! It is gender neutral and this swing will definitely be used for all my future children!! You can see how much my daughter enjoys the swing! If you are in the market for a new swing, but feel overwhelmed by all the choices, make sure to consider the InGenuity Cozy Coo Sway Seat! It is the best swing I have ever seen or used and they really have thought of everything with this swing! You are sure to love it as much as I (and my daughter) do! 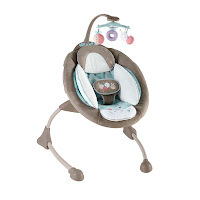 Buy It: You can purchase the Sumner InGenuity Cozy Coo Sway Seat exclusively at BuyBuy Baby. Win It: InGenuity is generously offering (1) Cozy Coo Sway Seat to a lucky winner!